☛ For the 2015 Soulpepper production of The Play’s the Thing, click HERE. Soulpepper first presented Ferenc Molnár's delightful 1926 comedy, "The Play's the Thing", in 1999 in only its second season. It showed that the company could not only encompass the grand drama of Schiller's "Don Carlos" and the satirical formality of Molière's "The Misanthrope" but also the urbane wit tinged with nostalgia of Central European comedy. The current revival is even better than the 1999 production. Everything about the dialogue and the action is crisper, cleaner, more precise. The show runs like clockwork. The Hungarian Molnár (1878-1952) uses a simple farcical plot for sophisticated look at the interplay of reality and illusion uncovering the artifice of the former and the truth of the latter. Unlike the anxiety and despair such a subject produces in Pirandello's "Six Characters in search of an Author", Molnár accepts the intermingling of real and unreal as a fact of life, gently amused that this should trouble anyone. Adapter P. G. Wodehouse of Jeeves and Wooster fame gives the work his own brand of witty absurdity. Successful dramatist Sandor Turai and his collaborator Mansky have written the libretto of a new operetta set to music by their protégé the young composer Albert Adam. Albert is engaged to the prima donna Ilona Szabo and all seems well until Turai and Mansky discover that Ilona's former lover Almady is also staying in the same castle they are and may be trying to rekindle his romance with Ilona. Outside Ilona's door the three operetta writers overhear Almady in passionate conversation with Ilona and assume the worst. The strife this causes makes Albert want to tear up his score and break with Ilona, but Turai has a plan to save the situation. He will try to convince Albert that what he overheard was merely Ilona and Almady rehearsing a play. Thus what was real will be made a fiction to cause a beneficial real effect. Anyone who thinks self-referentiality is a postmodern invention will be surprised to hear Molnár's characters speak of how a play should begin in actually beginning the play and enacting three possible Act 2 conclusions. When Ilona and Almady rehearse their actual conversation as Turai's play, mirrors reflects mirrors to wonderfully dizzying effect. With two exceptions the cast is the same as in 1999. Allegra Fulton plays Ilona, the role played by Karen Robinson and Jonathan Watton plays Albert, the role played by Mike Shara. Fulton waits until Act 3 to give Ilona much personality, a mixture of caprice and shame, but the show would be stronger if she had established this from the start. Watton emphasizes the composer's intensity over his youth making the part funnier and more believable. The other five actors make a welcome return. Diego Matamoros is the wry, witty Turai, masterfully in control of the action. William Webster is perfect as his foil Mansky, less intellectual and more prey to emotion. Michael Hanrahan is the ultra-proper servant Dwornitschek who contrasts with Jim Warren as the scatterbrained secretary Mell. 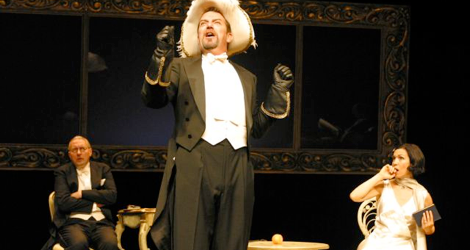 Again the actor who garners the most laughter of the evening is C. David Johnson as the pompous actor Almady. His performance in the rehearsal scene of Act 3 is priceless, as it dawns on him that Turai is punishing him by filling his lines with impossibly long French names. Showing Almady's attempts to maintain his dignity despite the risibility of his dialogue has the audience literally doubled over in laughter. Director Marton has sharpened the performances and the timing. He has encouraged a slight formality in the actors' gestures to underscore Molnár's view of the play as play. Julie Fox's set places highly ornate doorways and a window against black-curtained nothingness, again to bring out the sense of knowing artifice. Victoria Wallace's costumes complement the set and Kevin Lamotte's lighting reflects the precision given the whole work. This Viennese pastry of a play is even more delectable this time around. Give yourself a treat and see it. Photo: Jim Warren, C. David Johnson (centre) and Allegra Fulton. ©2003 Soulpepper Theatre Company.